First OFF: apologies for my long, unexplained absence from the F&M. Life calls- and with plans for moving out of state looming in my future I took on (rather rashly) a garage sale. WOW that was a lot of work. ANYHOO- I have visions of filling my new apartment with clouds of hanging plants. Starting with these adorable succulent terraria by Senorita from casasugar. 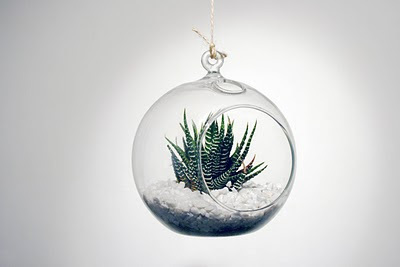 They look a little less challenging than a bottle terrarium.